Hydroxyapatite (HA) has ability of bone-like apatite formation, which consists with chemical interaction between the surface of HA and ions included in body fluid. Thus, proper surface modification might enhance the function. In the present study, the effect of phosphorous ion implantation on mechanical properties and bioactivity of HA was investigated. In order to clarify the effect of ion implantation dose, ion dose of 1 × 1012, 1 × 1013 and 1 × 1014 ions/cm2 were selected. 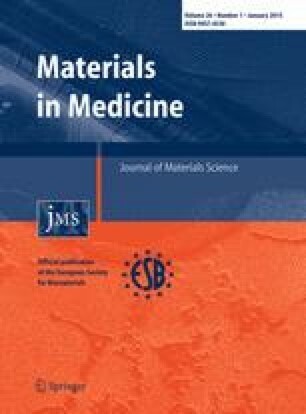 Mechanical properties and bioactivity were evaluated in 4-point bending tests and immersion test in simulated body fluid. Bending strength was reduced due to ion implantation. The amount of decreasing strength was similar regardless of ion implantation dose. Bone-like apatite formation was slightly delayed with ion implantation, however, improvement in interfacial strength between bone-like apatite layer and the base HA was indicated. From the results, the possibility of phosphorous ion implantation for enhancement of bioactivity of HA was proved.